Army (Heer) helmet pattern '35. 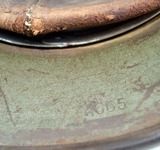 Steel helmet M35 for the German Army (Heer). The helmet is of the first pattern, rivets and liner ring are made in aluminium. With the same metal are made the chin strap rivets and buckle. The color is of the first pattern too, usually named (applegreen). The eagle in present for the most part. The national cocarde was removed in war time (1940) to reduce the visibility. Some small parts of the leather liner are missing. This helmet was found in north Italy. Marked. Rare. Notify me of updates to Army (Heer) helmet pattern '35.